In the bowl of a stand mixer fixed with the paddle attachment, combine flours, oats and whatever mix-ins you choose. Also add in salt, sugar and yeast and combine. Stir in water and oil to make a sticky, cohesive dough. Replace paddle attachment with dough hook and knead the bread on medium speed for about 5 minutes, or until dough is smooth and elastic. Pour dough into a lightly greased bowl, cover and let rise until doubled, about 1 to 1 1/2 hours. Punch down the risen dough and shape into a loaf. Place dough in a lightly greased 8 x 4-inch loaf pan, cover and let rise again until doubled, about 1 hour. Preheat oven to 375°F. Bake loaf for about 25 minutes, or until golden brown. Remove from oven and cool completely on cooling rack before slicing or serving. OK, so I have a lot more to add to my list, but I’m taking baby steps. Luckily, I found a recipe that lets me cross off all three of these resolutions. Ladies and gentlemen, I give you Multigrain Everything Bread. I know it’s not the prettiest bread you’ve ever seen, but don’t judge a book – er, bread – by its outward appearance. 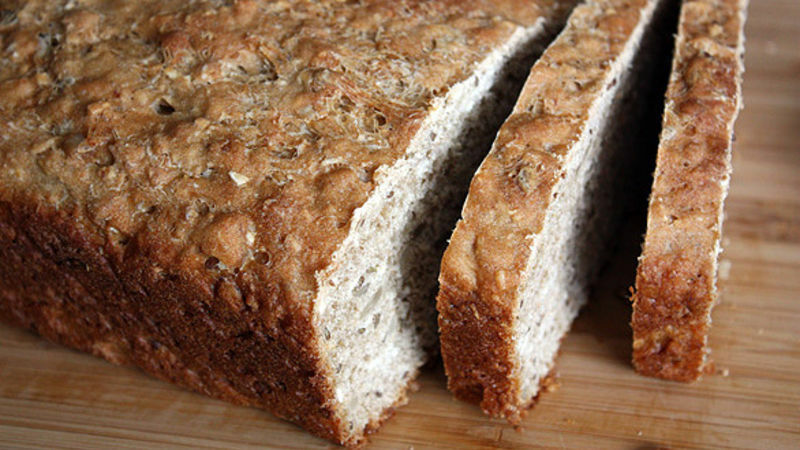 This bread is immensely flavorful, dense and yes, healthy. Resolution #1: Check. This loaf is also not tied down to a specific, by-the-book recipe. I thought about making it that way, but then realized that really, most anything can go into this loaf and it will still taste delicious. I used a combination of leftover ingredients I had in my kitchen cabinets: Rolled oats, flax seeds, bran, sunflower seeds and slivered almonds. You can either follow my lead, or use other kinds of seeds, cereals, nuts, dried fruits, rice, quinoa or bran. Go crazy with it. Experiment. Resolution #2: Check. And with all that stuff loaded into the bread, you have more space in your home (or at least I did). Resolution #3: Check. Though this recipe might not fall in line with your resolutions as well as it did with mine, it’s worth making this bread anyway. After all, eating good food should always be on your list!